This Elliott wave count begins at the end of the global financial crisis in March 2009. 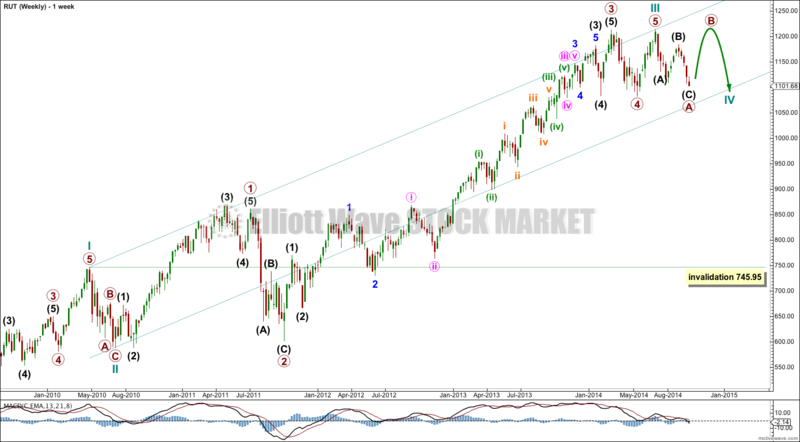 This Elliott wave count will focus only on the current upwards bull market, which is subdividing as an impulse. Click on charts to enlarge. Data available extends back only to the end of 1987. Data begins with the 1987 “crash” which I am labeling a cycle degree second wave correction. A five wave impulse for a super cycle wave (I) ended in March, 2000. Ratios of cycle degree waves within super cycle wave (I) cannot be accurately calculated without all data from the start of Russell 2000 in 1984. Super cycle wave (II) is seen as a complete expanded flat correction, with a shorter than usual C wave (which is not truncated because it does move very slightly below the end of cycle wave a). Cycle wave c is 45.87 points longer than 1.618 the length of cycle wave a, a variation just less than 10% and so acceptable. Super cycle wave (II) is a 50% correction of super cycle wave (I). Super cycle wave (I) lasted longer than 12 years (it begins when Russell 2000 began) and super cycle wave (II) lasted 9 years. At 1,691 super cycle wave (III) would reach 1.618 the length of super cycle wave (I). I am changing my wave count for RUT within super cycle wave (III) to see cycle wave III as over and cycle wave IV underway. Cycle wave III is 26.76 short of 1.618 the length of cycle wave I. Cycle wave IV may not move into cycle wave I price territory below 745.95. 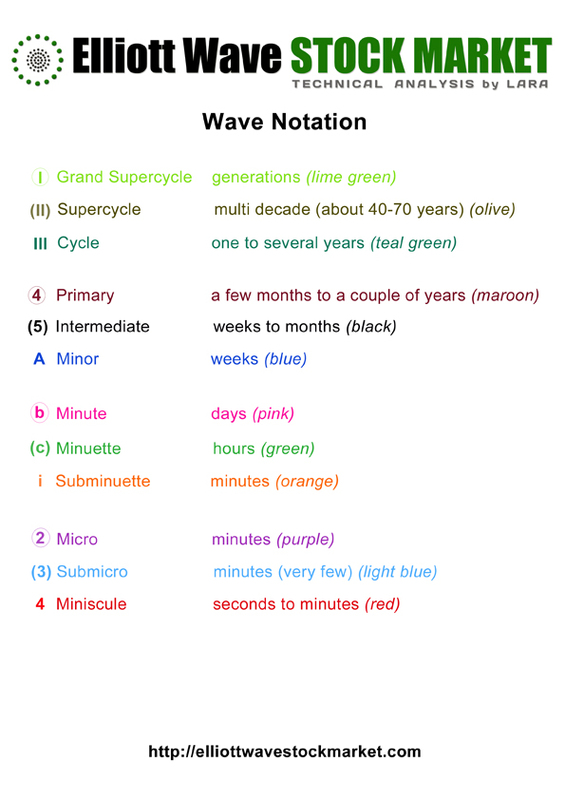 Super cycle wave (III) is incomplete. Within it cycle wave III is probably complete. Cycle wave IV looks like it is subdividing as a flat or combination. Within it primary wave B should move higher and may make a new high above 1,213.55. Cycle wave IV may find support at the lower edge of the channel. Draw the channel using Elliott’s first technique: draw the first trend line from the highs of cycle waves I to III, then place a parallel copy on the low of cycle wave II. Cycle wave II was a shallow 39% zigzag lasting 10 weeks. 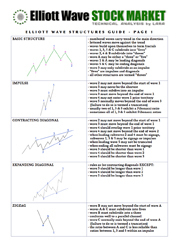 Cycle wave IV is showing alternation in depth and structure. So far it has lasted 13 weeks and it is not quite halfway through. The final fifth wave of primary wave 5 to complete cycle wave III subdivides perfectly as a five wave impulse. The downwards movement for primary wave A fits best as a zigzag, with an expanded flat for intermediate wave (B) in the middle. This sees the downwards movement labeled minor wave B within intermediate wave (B) as a zigzag which has a better fit than my last analysis. However, it is very difficult to see the upwards wave of minor wave C within intermediate wave (B) as a five because the middle of the third wave does not fit. I suspect something is wrong in my wave count at the beginning of this movement, within minute wave i and minuette wave (i), but I cannot move the time frame for this data down to see the subdivisions on the hourly chart. Intermediate wave (C) subdivides perfectly as a completed impulse. The final fifth wave may yet move lower. Draw a channel about intermediate wave (C): draw the first trend line from the ends of minor waves 1 to 3, then place a parallel copy on the end of minor wave 2. Only when this small channel is clearly breached by at least one daily candlestick above it and not touching the upper trend line will I have any confidence that primary wave A is over. If cycle wave IV is subdividing as a flat correction then within it primary wave B must reach up to a minimum 90% length of primary wave A at 1,202.36. If primary wave A moves lower this point must be recalculated. If cycle wave IV is unfolding as a combination then primary wave X has no minimum upwards point. For both a flat or combination the upwards wave of B or X may make a new high above the start of primary wave A at 1,213.55. There is no upper invalidation point. B and X waves can be time consuming. I would expect it to last about 13 weeks or longer. 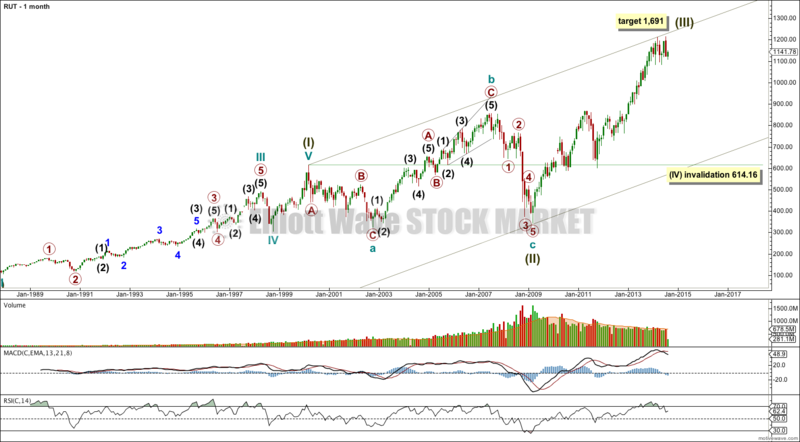 By request from a member here is an Elliott wave analysis of Russell 2000 using data from Yahoo Finance. Ratios within cycle wave III of super cycle wave (I) are: primary wave 3 has no Fibonacci ratio to primary wave 1, and primary wave 5 is 8.39 points short of 1.618 the length of primary wave 1. Ratios within primary wave 3 of cycle wave III are: intermediate wave (3) has no Fibonacci ratio to intermediate wave (1), and intermediate wave (5) is just 3.81 points longer than equality with intermediate wave (1). Ratios within intermediate wave (3) of primary wave 3 are: minor wave 3 has no Fibonacci ratio to minor wave 1, and minor wave 5 is 7.15 short of equality with minor wave 3. Ratios within primary wave 5 are: there is no Fibonacci ratio between intermediate waves (3) and (1), and intermediate wave (5) is 6.44 longer than 0.618 the length of intermediate wave (3). Super cycle wave (II) is seen as a complete expanded flat correction, with a shorter than usual C wave (which is not truncated because it does move very slightly below the end of cycle wave a). Cycle wave c is 45.87 points longer than 1.618 the length of cycle wave a, a variation just less than 10% and so acceptable. Within cycle wave a primary wave C is 8.82 longer than 2.618 the length of primary wave A, and I am seeing primary wave B as a double combination: zigzag – X – flat. Within cycle wave b there is no adequate Fibonacci ratio between primary waves A and C. Primary wave A is an impulse, and primary wave C fits perfectly as an ending expanding diagonal. I am confident this upwards wave for cycle wave b is a clear three wave structure, and so it is part of a larger correction. Within cycle wave c there are no Fibonacci ratios between primary waves 1, 3 and 5. Overall super cycle wave (II) is a 50% correction of super cycle wave (I). Super cycle wave (I) lasted longer than 12 years (it begins when Russell 2000 began) and super cycle wave (II) lasted 9 years. When super cycle wave (III) is finished then a subsequent correction for super cycle wave (IV) may not move into super cycle wave (I) price territory below 614.16. 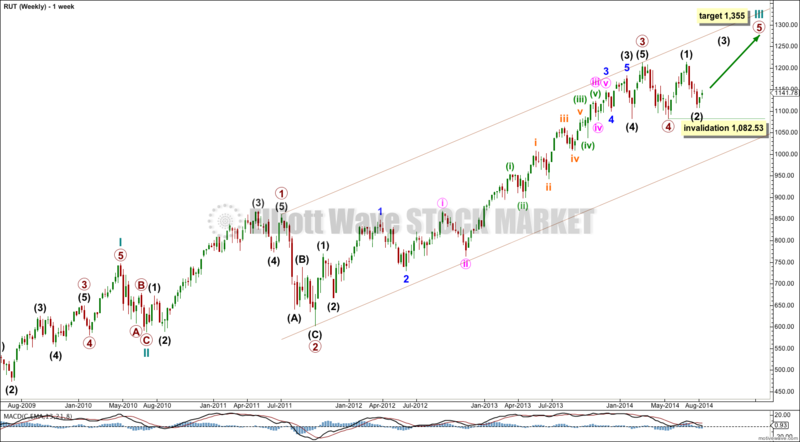 The weekly chart focusses on more detail within super cycle wave (III). Super cycle wave (III) is incomplete. Within it cycle wave III is also incomplete. Cycle wave III may only subdivide as an impulse. Ratios within cycle wave I are: primary wave 3 is 9.55 points longer than equality with primary wave 1, and primary wave 5 is just 3.77 points short of equality with primary wave 1. Ratios within primary wave 3 are: there is no Fibonacci ratio between intermediate waves (3) and (1), and intermediate wave (5) is just 2.05 points longer than 0.618 the length of intermediate wave (3). Within cycle wave III primary wave 3 has no adequate Fibonacci ratio to primary wave 1. It is likely that primary wave 5 will exhibit a Fibonacci ratio to either of primary waves 1 or 3. At 1,355 primary wave 5 would reach equality in length with primary wave 1. Primary wave 1 lasted 52 weeks, primary wave 2 lasted 13 weeks, primary wave 3 lasted 126 weeks, and primary wave 4 lasted 10 weeks. None of these waves exhibit a Fibonacci duration nor do their durations exhibit Fibonacci ratios to each other. I would expect primary wave 5 to last about 52 weeks, and so the target at 1,355 may be met in about another 40 weeks. Ratios within primary wave 3 are: intermediate wave (3) has no Fibonacci ratio to intermediate wave (1), and intermediate wave (5) is 8.35 points longer than 0.236 the length of intermediate wave (3). Ratios within intermediate wave (3) are: minor wave 3 has no Fibonacci ratio to minor wave 1, and minor wave 5 has no Fibonacci ratio to either of minor waves 3 or 1. Ratios within minor wave 3 are: minute wave iii is 3.54 points short of 2.618 the length of minute wave i, and minute wave v has no Fibonacci ratio to either of minute waves iii or i. Ratios within minute wave iii are: minuette wave (iii) is 8.36 points short of equality in length with minuette wave (i), and minuette wave (v) has no Fibonacci ratio to either of minuette waves (i) or (iii). Ratios within minuette wave (iii) are: subminuette wave iii is 10.9 points longer than equality with subminuette wave i, and subminuette wave v is just 3.12 points short of 0.618 the length of subminuette wave iii. If intermediate wave (2) moves any lower it may not move below the start of intermediate wave (1) at 1,082.53. 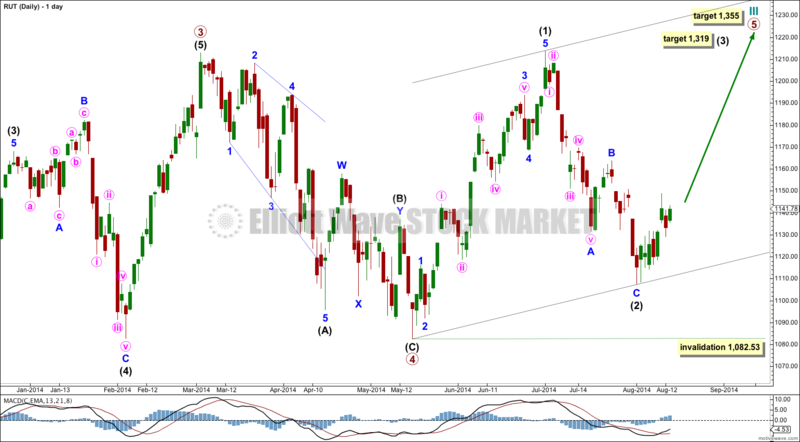 The daily chart focusses on the start of primary wave 5 within cycle wave III. What is most clear about this chart is the structure of intermediate wave (1): a clear five wave impulse with an extended third wave. This indicates the trend is upwards at this stage despite a deep second wave correction which followed it. Ratios within intermediate wave (1) are: there is no Fibonacci ratio between minor waves 3 and 1, and minor wave 5 has no Fibonacci ratio to either of minor waves 3 or 1. Ratios within minor wave 3 are: minute wave iii has no Fibonacci ratio to minute wave i, and minute wave v is just 1.46 points longer than 0.618 the length of minute wave iii. Within intermediate wave (2) minor wave C is 5.59 points short of 0.618 the length of minor wave A. Intermediate wave (2) is a typically very deep 81% zigzag structure. It is extremely likely it is over here. 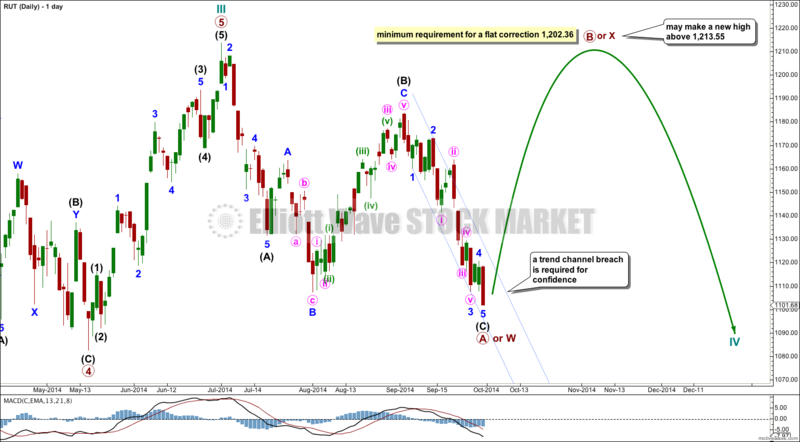 At 1,319 intermediate wave (3) would reach 1.618 the length of intermediate wave (1). I have drawn a base channel about intermediate waves (1) and (2). On the way upwards to the target for intermediate wave (3) downwards corrections should find support at the lower edge of this channel. This channel should not be breached to the downside. Upwards movement should breach the upper edge of the channel. From this first analysis of Russell 2000 I can say that it does not exhibit Fibonacci ratios between all three actionary waves of its impulses, but it often exhibits Fibonacci ratio between two of the three actionary waves within an impulse. Much like the S&P 500, but better than the Nasdaq. This means that target calculation would increase in accuracy only towards the end of a movement; it is only at the end of a movement that targets can be calculated at multiple wave degrees, and because of the tendency for not all actionary waves to exhibit Fibonacci ratios targets should be calculated at least at two or three wave degrees. The target at 1,319 would and should change once minor waves 3 and 4 within intermediate wave (3) are complete. Russell 2000 does not seem to exhibit Fibonacci relationships in the number of days, weeks or months a wave takes. This makes estimation of when targets may be met rather difficult. 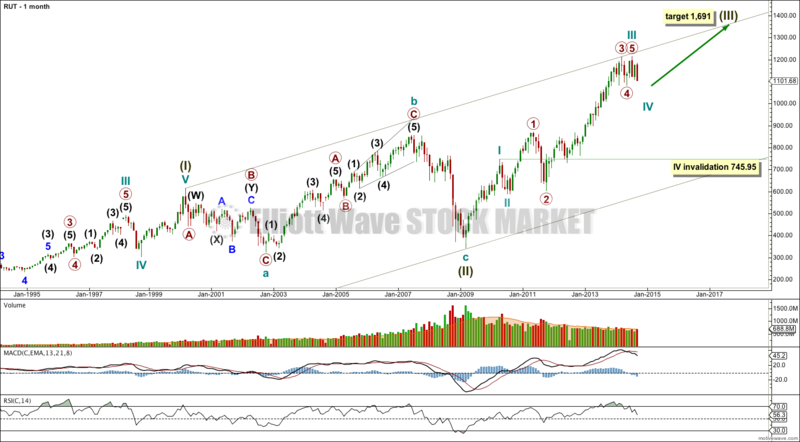 Russell 2000 does seem to exhibit reasonably normal looking Elliott wave structures, and some of these structures are exceedingly typical looking (like the impulse of intermediate wave (1) here on the daily chart). This means that predicted directions should be quite accurate, if the wave count is correct.